Welcome into the Birgittine sisters’ world of Gregorian chant! Also known as Frälsarorden, the Birgittine Order is the only one with Scandinavian origins. Saint Birgitta (ca 1303-1373) and her collaborator and confessor, Petrus Olavi of Skänninge, laid its foundations in Rome, in the 1350s. Birgitta had moved there in 1349, and remained in that city for the rest of her life. After the first Birgittine abbey opened in Vadstena in 1384, the order rapidly spread across Europe. 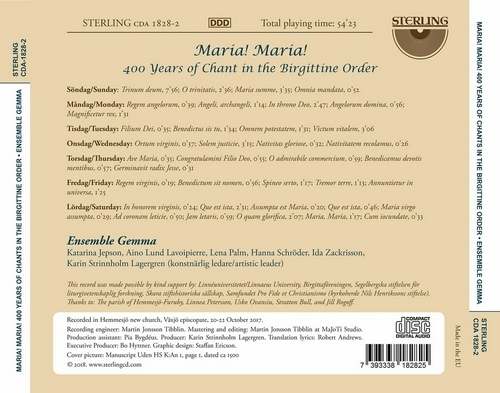 The chants on this recording are from the Birgittine Abbey, Maria Refugie in Uden, The Netherlands and this is the first time that chants from the rich collection in Maria Refugie have been recorded. It is also the first recording of the Birgittine repertoire from sources dating after the Middle Ages. I have selected 37 chants that reflect the musical and textual richness of Cantus sororum. 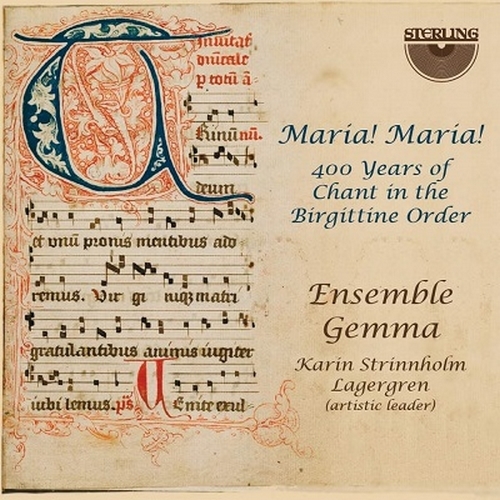 The material spans more than 400 years, yet forms a coherent repertoire that belongs to the Gregorian chant tradition in all important aspects, with a Birgittine twist. Recorded in Hemmesjo new church, Vaxjo episcopate, 20-22 October 2017.